We went on a Wild West safari to find these African critters! 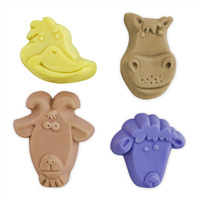 The Kids Critters 4 Soap Mold features a happy hippo, an entertaining elephant, a goofy giraffe, and a ludicrous lion. Perfect for gift-making projects with the kids. 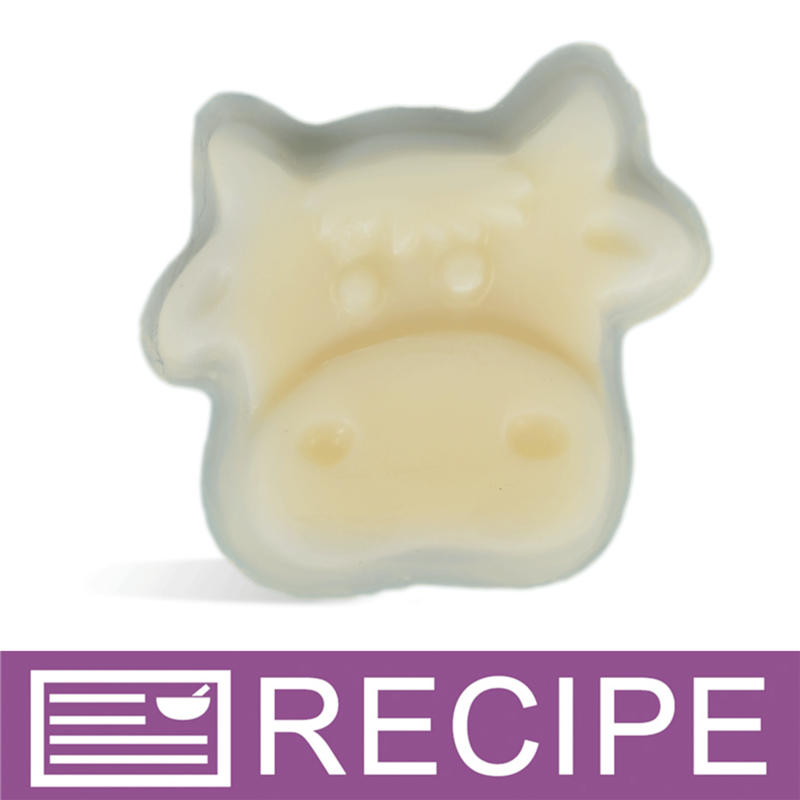 "Milky Way™ Kids Critters 4 Guest Soap Mold (MW 112"
COMMENTS: These make fantastic cute and whimsical kids soaps and baby shower favors. It is well detailed and if patient they come out of the mold nicely. I actually will be getting a few more. 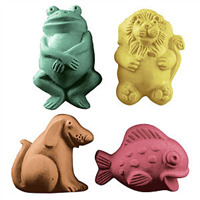 COMMENTS: This is a great mold for kids soaps, my grand daughter just loves it ! COMMENTS: These mild are adorable and the soap is a perfect size for kids. They were a little hard to get out of the mold, I put them in the freezer for a bit before attempting and it was still a little tough. They came out with out a scratch though. 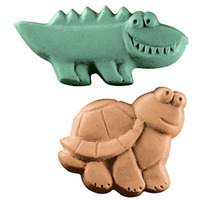 "Kids Critters 4 Guest Soap Mold 112"
COMMENTS: As cute as a bug, or critter! I have the other critters as well. I use a conbination of fudge brownie and nut scent and fruity scents. Children and adults all want these. I can not keep these on my table at craft fairs. I end up selling several hundred of them. And the mold is so easy to use. Unmolds well, just pops right out. One use and it has paid for itself. • Adorable. Kid appeal. Easily released. 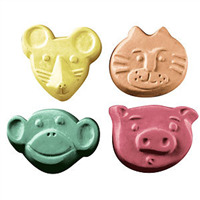 COMMENTS: I love these animal molds. Very easy to use and very convenient. Makes ideal size soaps. COMMENTS: I have bought several of these molds to make birthday favors. I have had an incredibly difficult time getting the M&P out of the cavities. I've filled to the top, put them in the freezer, sprayed with alcohol before filling, used a butter base; you name it. I don't think I'll be buying these again, even though the designs are so cute. WSP Response: The best way to unmold soap from a plastic mold is to place it in the freezer for about 45 minutes. The soap should be completely set up. Once the mold is removed, let set at room temperature for about 10 minutes. Turn mold over and gently press on cavity to remove soap. The soap will pull away from the mold and release. If it is still too hard to unmold, place back in freezer for 15 minutes. 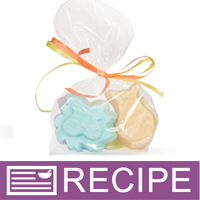 It is not necessary to spray or coat the mold with anything when making MP soap. 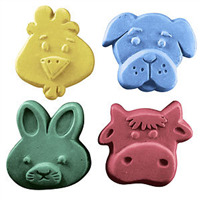 COMMENTS: I ordered these to have kid soaps since my children loved the Peep Soaps so much. Although it says how much each soap weighs, they were much bigger then I was imagining. I use the Monkey Farts Fragrance in them, and they are a huge hit! They are pretty easy to get out, I just have to push hard in the middle, but would be much better if they were made from Silicone. • Make the mold Silicone. "Hello, i would like to ask you about the soap size and if is possible the shipping in Greece. Thank you." Staff Answer This mold makes Giraffe: 2 ounces, 3" x 2" x 1" 1 cavity, Lion: 2 ounces, 2" x 2" x 1”, 1 cavity, Hippo: 2 ounces, 2" x 2" x 1", 1 cavity, Elephant: 2 ounces, 3" x 2” x 1", 1 cavity. If you would like to purchase from us you would need to complete the offshore agreement.